I met Noel Rodrigo of Leopard Safari in Sri Lanka and he set up a camp for me at Yala Park. My tent was by the river under a huge canopy of trees so it was cool during the day. Outside I had a great bush shower. I loved having a shower with nature all around me and it was so beautiful to cool off in the evening with the stars above. But my outside loo I had to get used to. It was a bit scary tip-toeing out to the loo at night, but thankfully I didn’t see any animals except a pretty yellow frog who decided to make its home in my toilet roll. Every morning I had a wake-up call at 5am and the best cup of coffee I’ve ever enjoyed. I jumped in the jeep with Noel at 5.15 am and off we went in search of leopards. Noel checked all the waterholes at dawn and dusk because leopards need to drink and the chances of seeing them is always good. He’s a great guide to be with and so knowledgeable about leopards. He’s called “the leopard man”, a title he deserves. 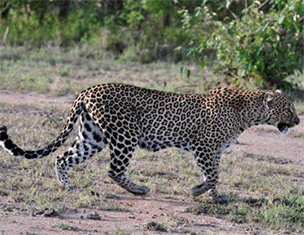 It is reported there are 65 leopards in Yala Park. Each leopard has its territory and Noel knows where to find each group. I had the pleasure of seeing glorious strutting peacocks every day, they were so beautiful with their iridescent colours. Herds of Asian elephants live in the park and one put his trunk through the back of the jeep. There was no danger, he was just inquisitive. On the last day I had the thrill of seeing six leopards. Noel knew where a mother had three cubs, and there they were, all playing together on the rocks. I was so happy I was speechless. The sun was setting and it was a grand finale to a great week.